A man who said he is the father of a white supremacist who attended the deadly rally in Charlottesville disavowed his son's “vile, hateful and racist rhetoric and actions” on Monday. “My name is Pearce Tefft, and I am writing to all, with regards to my youngest son, Peter Tefft, an avowed white nationalist who has been featured in a number of local news stories over the last several months,” Pearce Tefft wrote in a letter published on a North Dakota news site, Inforum. Angie Wieck, Inforum's community editor, confirmed to BuzzFeed News that the letter was sent to them by Peter Tefft's father, Pearce Tefft. “I, along with all of his siblings and his entire family, wish to loudly repudiate my son’s vile, hateful and racist rhetoric and actions,” he said. Pearce Tefft, who is from Fargo, North Dakota, wrote that Peter was no longer welcome at their family gatherings. “I pray my prodigal son will renounce his hateful beliefs and return home. Then and only then will I lay out the feast,” he said in the letter. Peter Tefft, who identifies himself as a “pro-white activist” on Twitter, posted a photograph of himself standing at the Robert E. Lee statue which white supremacists, neo-Nazis, and alt-righters rallied to protect from possible removal in Charlottesville. 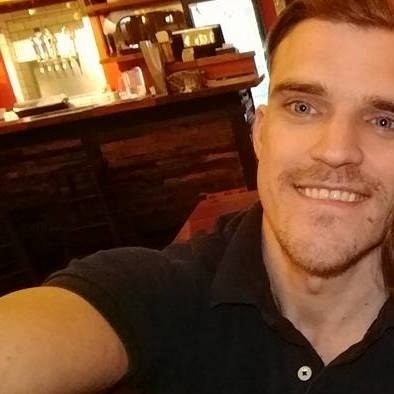 In a lengthy Facebook post about the violence sparked by the Unite the Right rally in Charlottesville, Peter Tefft defended James Alex Fields Jr., the 20-year-old man accused of killing a woman after plowing his car into a group of people gathered to protest the white supremacist rally. “Fatal crashes happen all the time, and it is clear that the young man’s car was being attacked on all sides by a roving mob of Antifa when he slammed the gas pedal and accelerated,” Peter Tefft wrote in the Facebook post on Sunday. “He will be acquitted because his life was clearly in danger by Antifa,” he wrote. Video of the incident does not suggest the car was under attack when it accelerated into the crowd, then backed out and fled. “This is the beginning of the White Civil Rights movement,” he wrote. In his letter, Pearce Tefft said the family did not know where his son learned his white nationalist beliefs. “I have taught all of my children that all men and women are created equal. That we must love each other all the same. Evidently Peter has chosen to unlearn these lessons, much to my and his family’s heartbreak and distress,” Pearce Tefft wrote. “We have been silent up until now, but now we see that this was a mistake. It was the silence of good people that allowed the Nazis to flourish the first time around, and it is the silence of good people that is allowing them to flourish now,” he wrote. Scott also demanded Peter Tefft to change his name immediately, claiming that several people were harassing his siblings and other relatives because of their presumed association. In a statement to Inforum, Scott said that Peter's sister had been threatened at her workplace under the assumption that she endorsed Nazism. He said that some of their relatives in Hawaii, including a 13-year-old cousin, had apparently received threatening messages online. 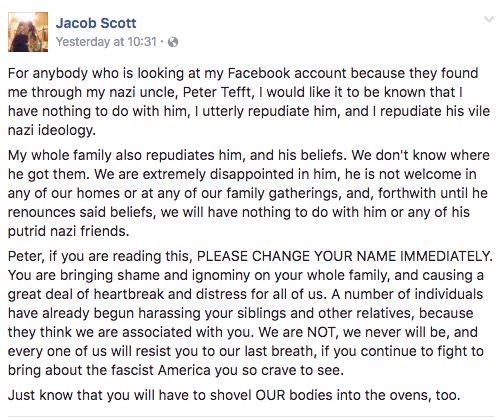 BuzzFeed News has reached out to Pearce Tefft, Peter Tefft, and Jacob Scott.